After a long autumn semester buying clothes, kitchen utensils and books to make their rooms and flats in Lithuania a little bit more like home, international students had a chance to make a good use of their things by donating them to those who really need. Before leaving Lithuania and going home, students were donating things they won’t be using anymore or taking back to their countries. Students mostly donated clothes and shoes. Kitchen and home utensils like cups, kettles, pans and cutlery were a common donation as well. ESN Lithuania came up with the idea to gather and later on donate things from Erasmus and exchange students because all volunteers of the network saw how many things students leave when they departure from Lithuania after their exchange semester. Moreover, students themselves were often asking where they could leave things they don't need, as throwing them away after using only a couple of months seemed like a waste. Social campaign ‘Don't be a thingist’ was running for both spring and autumn semesters in 2017. Both times it engaged students from more than 6 higher education institutions in 2 cities. Big universities and small colleges alike gathered many good quality items for people who cannot afford them. With the help of platform www.aukokdaiktus.lt, the donated goods reached people in Vilnius and Kaunas. ESN Lithuania and www.aukokdaiktus.lt started their partnership in 2012 and since then organized a couple of similar social campaigns. ‘Don't be a thingist’ was organized as a part of the project SocialErasmus by Erasmus Student Network. The project is encouraging international students not only to explore the culture and country they are studying at but also to leave a piece of them in it by helping those in need or getting involved in various volunteering activities. The project, as well as the ‘Don't be a thingist’ campaign is continuously getting more awareness and attracting more students. Thus, the events will continue upcoming semester. International students can join Social Inclusion days, together with ESN volunteers visit various animal shelters and centres of people with disabilities, enrich local community by volunteering for different causes, and, again, before they leave, donate things to others. Local students are also very welcome to join SocialErasmus events and volunteer. More information and news about the events can be found on ESN Lithuania Facebook page. Between 2nd and 8th May 2016, the sections of Erasmus Student Network (ESN) will organise volunteering activities that have a social impact under the umbrella of SocialErasmus Week Spring 2016, a biannual celebration of the SocialErasmus project. SocialErasmus is an international project developed in Poland in 2009, that became recognised internationally by the network in 2010. The project was created with the purpose of involving international youth in their local communities by volunteering in their host countriesand contributing to the surrounding society. In order to better show the social impact of the project, all ESN sections are invited to organise activities in the same timeframe, twice per year, in what it is known as SocialErasmus Week. SocialErasmus promotes a social attitude among international students and facilitates their social integration into the local community while exploring the added value that resides in Europe's diversity. Besides this, international volunteers have a better chance to expand their knowledge of other cultures and educational systems and to have a first-hand experience with locals. Through their engagement, students enrich their curricula, gain experiences, knowledge, understanding, and a sense of appreciation for Europe. Also, they show others that mobility does not only consist of travelling or studying abroad, but also active engagement. ESN sections are encouraged to organise their best and most innovative SocialErasmus activities this week. During this edition, the focus is on the importance of the social impact international volunteers have upon the local communities. Even though they are not wearing capes, the volunteers are seen as heroes. They dedicate their time to make a difference in the societies they are in and to make life easier for the people around them. The activities are open for everyone who wants to give something back and to leave his/her mark in the surrounding community. Follow the event on social media with the hashtags #SocialErasmus, #SocialErasmusWeekand #LeaveYourMark! For more information about SocialErasmus Week Spring 2016, please visit the Facebook event. More information on the SocialErasmus project can be found onsocialerasmus.esn.org. On April 8th 2016, hundreds of young volunteers will have the opportunity to make a difference in Warsaw during the Erasmus Student Network (ESN) Annual General Meeting (AGM), the largest student conference of its kind in Europe focusing on the theme of mobility. As mobility does not only consist of traveling and studying abroad, ESN has been implementing SocialErasmus since 2010: a project that involves young citizens during their mobility experience through volunteering activities that take social action and foster change in the society. SocialErasmus aims to enrich the international experience of young people abroad with volunteering activities that allow them to understand society’s problems and to work on the solutions, and provides an opportunity for international young people to get to know other realities and learn how they can contribute to improve society as citizens of the world. During the International Infomarket, the most comprehensive study fair organised in Poland that will be held on the campus of Warsaw School of Economics on the 8th of April, SocialErasmus will be manning a stand where it will be possible to not only to learn more about the project and the great opportunities it provides to international students, but where it will be also possible to deliver postcards with words of encouragements that will later be given to hospitalized children. The objective of this initiative is to provide AGM participants the chance to take part in SocialErasmus in Warsaw, the host city of the event, and to have a positive impact on the local community. 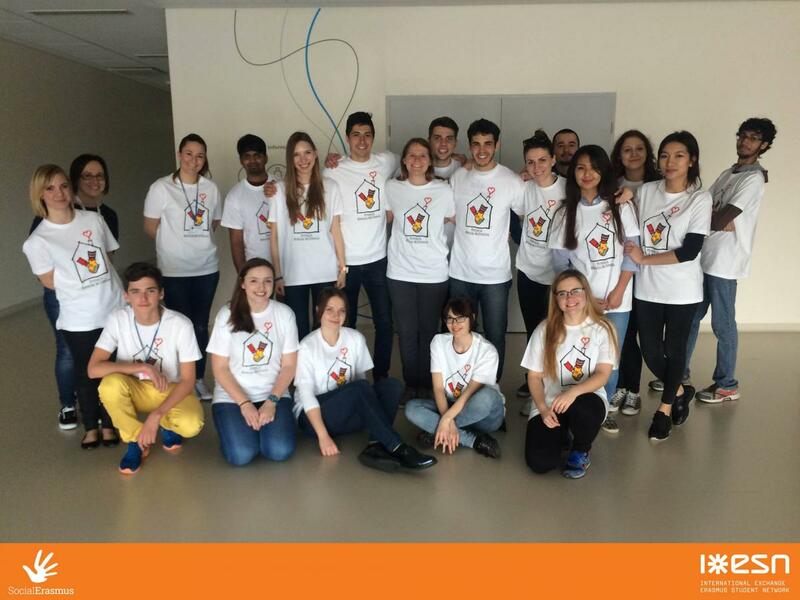 After AGM, on the 20th of April, ESN volunteers will gather Erasmus+ participants living in Warsaw and, with the support of Ronald McDonald House Charities, our partners for this initiative, will visit a local children’s hospital to deliver the postcards and spend some time with the kids. This group of young volunteers will organize cultural visit full of fun, including presentations about countries, colouring books with famous landmarks of their countries and other activities. Every year, more than 3000 social activities are organised by ESN volunteers all over Europe as part of the SocialErasmus project, engaging more than 20 000 international students. This initiative in Warsaw will enable young people to experience something new and gain an all-encompassing new perspective on internationalisation and its impact on society. Erasmus Student Network (ESN) is the biggest student association in Europe. Present in more than 500 Higher Education Institutions from 38 countries, ESN is the key volunteer student organisation in international higher education in Europe and provides opportunities for cultural understanding and self-development under the principle of SHS - Students Helping Students. It’s a wonderful time of the year. Easter holiday comes to our country and welcomes the spring! Playing Easter games and eating traditional dishes brings families together. But not all the people can share their joy and happiness with beloved ones. That’s why sections of ESN Lithuania together with SocialErasmus Coordinator decided to do a good deed and unite international students with the children and elders to celebrate it together. The sections visited children day centers, orphanages and elderly homes and spread the Easter spirit all over the place. They decorated eggs, played traditional games and even prepared musical performances. Let’s have a look what kind of activities some sections had during past two weeks. On 24th of March ESN KK have celebrated Easter in a very traditional way. They taught international students how to decorate Easter eggs in all kinds of different ways. After that they all together have visited elderly house and shared their countries Easter traditions with elders. On 26th of March ESN ISLB team together with international students went to Čižiūnai Orphanage and spent a memorable time with children. Students played games, balloon fight, and football match with their new little friends. The day was summed up with the Easter dinner where they presented musical performance. On 27th of March ESN KUK with Erasmus students went to a child day care centre. They were introduced with all children’s activities, decorated eggs, played games, learned several Lithuanian words and had an amazing time together. On 30th of March ESN VGTU organized a visit to one pension in Vilnius, where students learnt old traditions of painting eggs with wax and Easter games, as well. They were really kindly welcomed there by livers of the pension and even given some handmade presents. After the big job while decorating eggs, they had coffee and cake time and SURPRISINGLY, the barrier of language differences didn’t cause any discomfort. We also had the most beautiful egg election and the “Rolling eggs game”, which was really funny. On 3rd of April ESN LEU members and their exchange students together with ESN MRU Vilnius exchange students spent some time with children at the children’s day center. The children were happy to have visitors from all around the world. All together international students and local communities built the bridges between different cultures and traditions. The ESN Lithuania team hopes that the warmth sections have shared with children and elders were appreciated and made them happier and that it was unforgettable experiences for international students as well. This year ESN Lithuania had an amazing SocialErasmus week. 10 sections representing all 4 ESN cities of Lithuania have joined the initiative. Even 15 activities were organized. The first day was started with our second National event „Give a smile for children“. The idea was to collect white coins from Erasmus students (all March) and then buy something nice for children. We decided to visit children in different cities. So we did by we viting Pamūšio child care homes, Old Town Children Day Center, Children day care center, „Vaikų ir Paauglių Socialinis Centras“. All those meetings during this day ware awesome. Students were happy and proved us, that they would love to come back. During next days we had events like visit in Lithuanian educational centre, two Erasmus fairytales in school, small things can make you happy – we were giving people sweets with words like „Smile, it‘s simple“, two visits in pet shelter, what makes you happy, two free hugs activities, change a cigarete – don‘t smoke better eat a chocolade, Erasmus forest – it‘s nice to plant trees by ourselves, visit in the horse farm, action "Have a Nice Day". SocialErasmus week was finished with the video „I love you, Mom“ from ESN VMU. Erasmus students said in their language „I love you, Mom“. All those activities showed us that together we are power. SocialErasmus week was full of positive mood, smiles and lots of love and hugs. Thanks for all, who has participated in this week and just keep being social. About SocialErasmus Coordinators Meeting in few minutes together with SocialErasmus Lithuania coordinator OnutėBumbulytė! SECM – SocialErasmus Coordinators Meeting. This time National and Local SocialErasmus coordinators decided to meet in Prague, Czech Republic. Me as a National SocialErasmus Coordinator and Agnė Babelytė as a Local Coordinator departed from Lithuania on 24th of October. SECM started on 25th of October. This meeting lasted for 4 days, till 28th of October. So, we had the most interesting all four days to discuss about SocialErasmus, share our experiences, solve the biggest problems. SECM is for all Local and National SocialErasmus coordinators. All SE coordinators from entire Europe and every single section of ESN are invited. This is a great opportunity to understand the concept of SocialErasmus better, think about responsibilities of SE coordinators for once more. During this meeting you can share your experiences, cover both - positive and negative - sides of it. Also it’s a great meeting for problems solving, searching for solutions together. Sharing ideas is a proper way to be more social, to organise more activities, implement something new in your country, just to be inspired by other coordinators and then realise something you have only been dreaming about. During SECM we were speaking about many things. We were trying to figure out, what should the national team look like in the future, what should we do to motivate coordinators and students to contribute in our social activities. We decided that all, National and Local SocialErasmus coordinators, have to register social activities in SE website. If we will cooperate on that, it will be easier for Europe to see what each country is doing and that all together we are doing a lot. This is the best way to share material and let the Europe to know about us. What is the most important thing you have learned about SocialErasmus there? SocialErasmus in not only going to schools as you might think. It’s much more. It’s help for old people to go out from the room, speak with them or even clean forest together. After this meeting SocialErasmus is something more for me. It is all activities which can be useful for society, all things which changes things in a good way. SocialErasmus – being social, feeling better. What new have you learned? After this meeting I came back home full of ideas, what I should be changed to make SocialErasmus in Lithuania even better. If you want to change something – just do it, don’t sit in one place and just speak about it. Did you enjoy being there? Yes, a lot. It was great opportunity to meet new people, hear, what others are doing, understand, what should I actually do. For this opportunity to go there I’m saying thanks for my university, International Relations department at Šiauliai university. Thank you, Onute, very much for the ideas shared and wish you to have a fruitful cadency! P. Cvirka square had notions saying “WARNING. FRESHLY PAINTED.” next to them. At the beginning, many passers-by were unsatisfied for they had to change their plans and search for another park to sit. After a moment, they saw a group of students, who were painting the benches with smiles and enthusiasm in their faces. Curiosity was unbearable and so people sat on stairs and lawn to observe the process, catching the positive vibes of students and gradually, starting to smile themselves. The bravest and most curious came closer and started asking for more information about the initiative they were witnessing. Finally, it turned out that the benches were painted by volunteers from Erasmus Student Network Lithuania (ESN Lithuania): there were Lithuanians from Vilnius University, Vilnius Gediminas Technical University with the exchange program Erasmus students from USA, Croatia, Spain and Czech Republic as well as students of International School of Law and Business from India and Belarus. Many were surprised by the fact that students had no sponsors: all the money for benches renovation was gathered by previously mentioned high schools and University of Applied Social Sciences. The members of ESN in these institutions united to attain one goal: to motivate both Lithuanian and Erasmus students to collect white coins and prove that even students, who are just in the process of building their future careers, can be socially responsible. The members of ESN were happy with their job and emphasized, that it may only seem that it was very difficult to gather money for the renovation of 25 benches: a single white coin seems to be meaningless, but when people pool their coins, they unite and are able to make significant changes. The administration of “Vilnius Parks” were also pleased with students’ job and allowed ESN members to pain the logo of the organization on the renovated benches. P. Cvirka square will become their favourite park and an ‘own’ place in Vilnius. SocialErasmus project “Erasmus fairy-tale” for the first time was realized in December 2010. ESN VGTU (Vilnius Gediminas Technical University) wanted to do something special, something they had never done before, so their vicepresident Gintarė Vaiginytė and VGTU International Relations manager Jelena Mazaj came up with an idea of a new social project: they have suggested to prepare a fairy-tale before Christmas: to teach Erasmus students a fairy-tale in Lithuanian and perform it in the kindergarten, and… this project is continuing until these days! While volunteers are still preparing for new performance, called “Pagrandukas” (English - “Round bun”), we are curious to know more details how ESN VGTU is implementing this project. Today we speak with Sigita Pociūtė - current ESN VGTU SocialErasmus project coordinator and Justina Prunskaitė, who is responsible for „Erasmus Tale“ implementation this semester. How you choose tales and actors? We are thinking about it all together during our Social Committee meetings. Members of committee wrote down all the nice fairytales they know, but still it is difficult to choose the best one, but somehow we make decision. For example this semester we have chosen already mentioned “Round bun”, because one of committee members saw this tale, performed by her relative and she noticed that children were impressed. Concerning actors, we invite volunteers by announcing the first audition on our facebook page. Those who come and, after seeing what kind of activity it is, still stay, these people are our actors. Then, we divide roles by discussing among each other… always in friendly way. How much time you need to prepare the performance? Practice makes it perfect, so almost whole semester. Making decorations for the performance also takes some time, as most of them we do by ourselves, some of them we get with a little help of our friends. To create decoration we organize workshops. For example, last semester we were preparing for the fairytale ,,The sky is falling“ : Spanish guys made a house from cardboard; Other actors created domino masks decorating them with the features of different animals. After the performance in the kindergarten we gave the masks to children, because we thought it was the last performance. But then we decided to make more children smile, so we arranged one more performance and we had to create new masks. Where you usually show these performances? In kindergarten and children hospital. But this year we also want to have one performance at Bernardinai Children centre (social center). Mentioned institutions are always waiting for us, welcomes us warmly - they have already seen previous performances and know how amazing this project is. And what is the feedback from Erasmus exchange students? Do they enjoy participating in this project? The feedback is always positive. Our actors are very artistic and creative, also the enjoy learning fairy-tale in Lithuanian: some words for them look funny, and some learnt words they can even use outside rehearsals, so - it is useful and fun. What is the main challenge implementing this project? The most difficult part is gathering actors to rehearsals. Everybody is very busy, it is hard for students to find some time for rehearsals and not to be late. European Parliament Information Office in Lithuania invites to follow together the European Ombudsman, P. Nikiforos Diamandouros event "It's our Europe: Let's get active!" and join the debate on Twitter. When: Tuesday, April 23, starting at 10:30, ending at 13:30. "It's our Europe: Let's get active!" The European Ombudsman, P. Nikiforos Diamandouros, is organising this event to help focus on European citizens and how they can concretely contribute to shaping the European Union, either by using the European Citizens' Initiative (ECI), by turning to the European Ombudsman, or by mobilising large groups of citizens to carry out grassroots initiatives. Please feel free to share this invitation with anyone who might be interested.